We hear a lot about the need for diversity and inclusion in technology companies. Both “diversity” and “inclusion” are frequently-used buzzwords, yet many well-meaning organizations struggle to assess their own strengths and weaknesses in how they recruit, hire, educate, retain, and promote—let alone make changes. 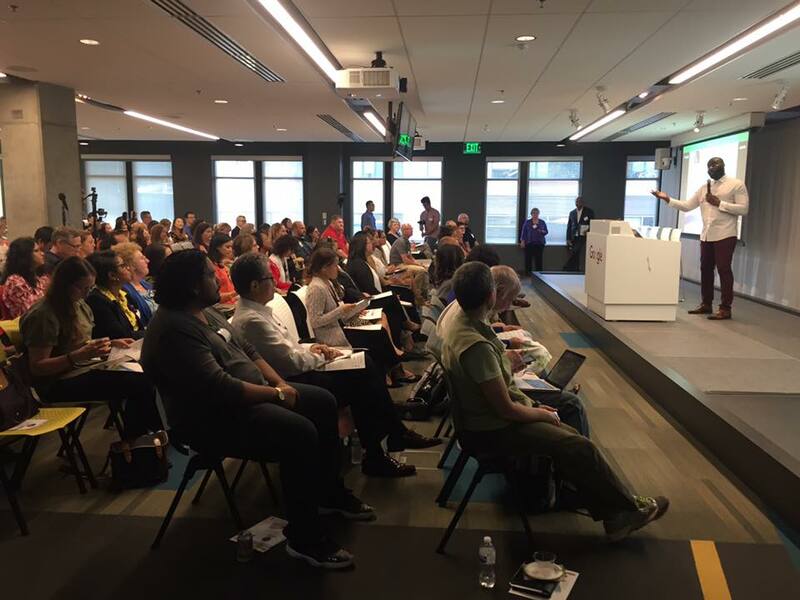 For those reasons, I leapt at the chance to represent Code Fellows for the event, “Do What Works: The Diversity & Inclusion Guide for Excellence” hosted by Google, alongside two other Code Fellows graduates. As the registration hosts, we got to interact with and be inspired by people who are actively improving the workplace and making it more welcoming to more demographics. This was a new and interesting community to interact with for me; as a recipient of one of Code Fellows’ Diversity Scholarships, I’ve seen firsthand how an organization supports underrepresented groups in technology by providing access to technical and job skills training. Equally important are individuals and organizations working to build inclusive cultures and retain—not just attract—diverse talent. This event offered attendees tools and resources to quantify how well their organizations were doing and how to move forward. The main focus was the launch of the Global Diversity & Inclusion Benchmarks document (GDIB). This 80-page document is the opposite of vague; written by two main authors, Julie O’Mara and Alan Richter, it encompasses the work of 95 experts and is meant to be a concrete guide to diagnose and improve organizational diversity/inclusion issues. If you are a company looking to align with best practices around building a Diversity & Inclusion strategy, this is a great resource to consider. After the main presentation and a short panel discussion, participants broke into 15 smaller, expert-led groups on topics such as “Changing Outcomes for Recruitment & Retention with Intention and Continuous Improvement” led by Carrie McNally from the Seattle Police Deptartment and “Shifting D&I training from Inactive to Best Practice” led by Karen Wilkins-Mickey from Alaska Airlines. These groups offered a chance to have real conversations about challenges people are facing in getting traction on diversity and inclusion in their organizations, and let others provide solutions on what’s worked for their company. I want to read the GDIB. Sounds pretty obvious, but it’s not necessarily a given that you leave a conference fired up to read an 80-page document! I find it exciting that such a broad-based group of people around the world have put together such a concrete guide. There is a lot of passion around this work, from diverse sectors. I expected a mostly tech audience, but there was a good mix of people from local government, local non-tech businesses, and even out-of-state attendees and college students. As the event went on, it gathered momentum and energy; attendees shared more of their personal experiences and they were actively listened to. I can build my own diverse and inclusive network. Steve Matly, one of the panelists and an SM Diversity manager, suggested that one of the ways we can combat our own unconscious bias is by joining activities where we are likely to meet people from different backgrounds. By doing activities together, we can unite under the common banner of “golfer,” “volunteer,” or “bread maker,” rather than one of our demographics. As a recent Code Fellows graduate, my focus is on doing well in my next role as a software developer. But this event reminded me that I don’t have to wait until I’m in a management position to be an advocate for change in technology; I can educate myself, I can broaden my network, and I can share my awareness to my team. Looking for more ways to get involved? See upcoming events or get in touch!